Will 2010 Be the Year of the Slate PC? If 2009 was the year of the netbook then 2010 may be the year of the slate PC. 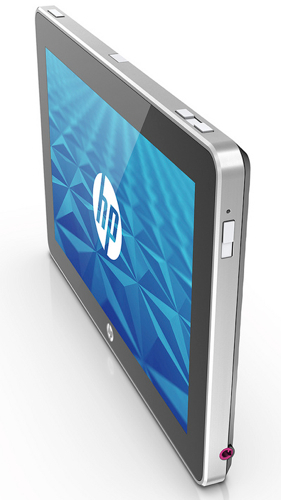 Apple’s iPad tablet device on follows the demonstration of an HP tablet device (also called a slate PC) at the CES. As the recession hit the US in 2009, computer sales were only 2.8% up in the US as compared to a 24% increase in 2008. In fact the first three quarters of 2009 were awful for computer sales across the country – until netbooks saved the day in Q4. The idea of a 10″ touch screen device that has the power of a notebook and the size of a netbook intrigues me. I can see moving my front desk employees off their desktop PCs and onto iPads or Slates. I thought it was really interesting that Apple is only introducing the iPad in one size. Apple is clearly targeting the iPad as a lifestyle device while PC manufacturers are targeting the slate form factor as a flexible and useful productivity tool. Its almost like apple is lining up another Mac vs. PC battle that they can never win – a proprietary Apple device with a closed software distribution channel and PC with flexible devices with customizable options and a ton of inexpensive software already in the pipe. While PC manufacturers will most likely sell many more slates than Apple will iPads, the real money is not in the device its self, it is in the content that is consumed on the device. Apple will be releasing its new web-based version of iTunes later this year, which will allow Apple users to synchronize their content between multiple devices like an iPhone, and iPod and an iPad. Apple followed a similar release model with the iPhone. When the 1st generation phone was released it was lacking in many basic cell phone features (ability to shoot video, picture messaging, etc) yet Apple released it anyway. They needed to get a device in the market so developers would begin building content. As the content grew, so did iPhone’s advantage over other smart phones and subsequent versions could be subsidized to include more features because Apple was making it back on the content. I would expect a similar model for the iPad. The 1st generation device has no webcam, yet has software handles for video calling for example. I would expect subsequent revisions of the iPad to add additional features as the content growth allows. How do you think the iPad will do? Going by the buzz in the market.. I feel its already a rage..but i would say you are correct..they can not beat PC manufacturers in sales volume.. but overall.. ipad will definitely prove to the prize product for apple. I usually think Apple stuff is cool, although due to being overpriced I’ve never bought anything from them, but I really don’t see the appeal of the iPad, apart from the interface and being nice and light. It’s alright for Jobs to slag off netbooks, but a netbook will run any windows app, that’s tens of thousands of apps, many of which are free and I already know how to use. A netbook also has much better connectivity, a real keyboard (not a seperate keyboard dock at additional cost), far more storage for the price etc. I can also change the OS on a netbook. The latest netbooks like the EEE 1201N with the dual core CPUs and nVidia Ion (8400M GPU) even have respectible gaming performance (search for 1201N on youtube). I’d take features and versatility over cool anyday. I think that the IPad will change the way we communicate at home, in offices or on the go. Many new applications are likely to evolve and we may just be on the threshold of a major change in the way many things are done in our daily lives. Others will have no choice but to follow with me too products. I think the iPad is going to be a roaring success, and foresee significant upgrades in future models, so personally I’ll hold out for the 2nd or 3rd generation device. At $499 lots of people will buy it purely for novelty value, and the price for more versatile future iPads is likely to be a bit higher. Yes i think that in year 2010 all PC will be slate. because all monitor convert LCD into TFT. I believe some manufacturers will offer a low cost data plan, provided by a phone company. That will make the slate much more mobile than a device that requires a WiFi connection. I am too late in writing this, I like to thank you for your advance thinking power as of today we are seeing number of tablets and pads available in the market. Thanks for writing such useful post about future gadgets.